Mold and mildew can be deeply detrimental to your health and your home. 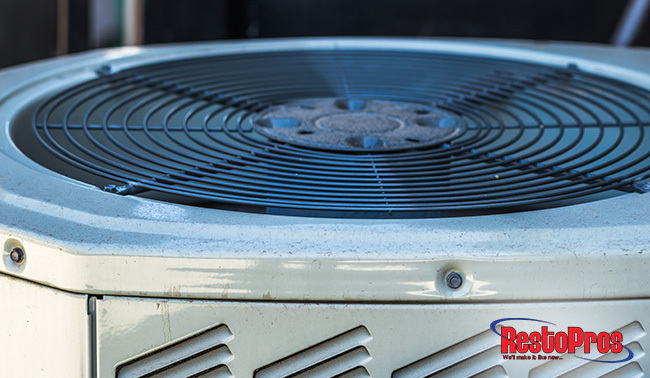 If you, like most homeowners, shudder at the thought of it invading your house, learn how to protect your AC unit from mold by following these expert tips from the team at RestoPros. Especially while you are away during the day or on vacation, keeping your AC unit running can control the humidity levels in your home. Therefore, you should set your unit to the “auto” mode while you are away, rather than turning your AC completely off. Mold tends to grow more commonly on AC units that have been dormant for a period of time. Routine maintenance of your HVAC equipment is imperative to keeping everything in good working condition. Especially during the transition between winter and spring, you should have your AC unit professionally serviced. Because AC units are dark and warm on the inside, they can be an ideal breeding ground for mold and mildew. You can prevent this with good cleaning habits and regular maintenance. Use a wet/dry vacuum to remove debris from the interior of your condenser/compressor. Then, use the brush attachment on a shop vac to remove outside dirt. Next, clean the fins by spraying them from the inside with a gentle garden hose. You can also use a fin cleaning spray for a deeper clean. Once you have done these tasks, be sure to clean the area around the unit, raking away leaves and trimming overgrowth. Clean the evaporator coil on your indoor unit. Opening the evaporator coil door on the blower/furnace unit, gently dust the coil with a soft brush. Then, spray the coil with no-rinse coil cleaner and allow it to foam and drip into the drain pan. Next, clean out the drain pan with soapy hot water and a little bit of bleach. Then, pour a cup of 50% bleach and 50% water down the drain. Clean your plugged evaporator drain. Over time, mold can build up in your evaporator drain. To clean it, find the drain line where it leaves the evaporator coil enclosure. Once you locate the end of this line, use a wet/dry vac to clear the drain. Moisture control within and around your AC unit is essential to mold prevention. Your ducts are the vessel through which all conditioned air travels to reach your home. Therefore, any mold growth in your ducts can threaten your air quality dramatically. To keep your ducts mold-free, you need to keep them moisture-free. You can do this by maintaining your draining channels and regularly checking for and repairing any leaks. If you ever find standing water anywhere in your duct system, you should have your system professionally serviced asap. In the case of window units, you should invest in models with humidity control. Because the blower filters in your HVAC system are the main line of defense between your indoor air and mold spores, changing them regularly is an important step to keep your AC unit mold-free. You should change these filters at least twice a year, but we recommend every 3-4 months for homeowners with pets or who live in a dusty area. Furthermore, we recommend using HEPA filters to remove the greatest volume of pollutants and allergens from your air. Although it may seem like the ultimate catch-22, a happy AC unit = clean air, and clean air = a happy AC unit. In other words, in order for your AC unit to stay clean and free of mold-causing dust particles, you should keep your home clean. Regularly dust and vacuum your home to reduce the level of particle buildup within your AC unit. As experienced mold experts, we have a wealth of solutions to protect your AC unit from mold. If you are looking for professional help with mold intervention or remediation, call RestoPros today at 855-587-3786 or fill out a service request form on our website!